The 25.6 metre expedition yacht Tatu has been listed for sale by Michael Selter at Crow’s Nest Yachts. Built in GRP by US yard Delta Marine to a design by Seaton & Neville, Tatu was delivered in 1984. In 2014 she went back to the yard to have her hull extended to its current length, turning her into a fishing expedition yacht. Accommodation is for up to ten guests in four cabins arranged as a master suite, VIP suite and two doubles plus two Pullman berths, all with entertainment centres and en suite bathroom facilities. The main saloon of this yacht for sale has large windows, allowing natural light to stream in. There is a large U-shaped sofa, coffee table and two large ottomans to starboard, while on the portside her entertainment centre features a 52-inch flatscreen television set and a full audio/visual system. Forward of the saloon is the dining area with a mahogany table and chairs seating up to eight guests. There is a bar area seating four guests that faces the galley, making for easy entertaining. The galley is situated to starboard and is open to the saloon, featuring top-end appliances and a backlit cabinet for storing glassware. On deck, the flybridge has a double helm seat and L-shaped seating for six with a table and several sun pads. A single 400hp Caterpillar diesel engine allows a maximum speed of 11 knots and a range of 3,000 nautical miles at nine knots. 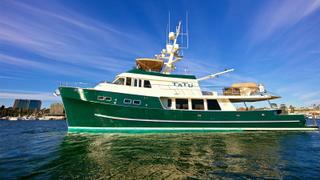 Lying in San Diego, California, Tatu is asking $2,690,000.